FANBOY PLANET.com . : Mark-Hamill-Killing-Joke :. Mark Hamill Voicing The Killing Joke? At the Warner Animation panel at Comic-Con, the team announced that after many years of rumors, Alan Moore and Brian Bolland's Batman: The Killing Joke would be adapted into an animated film. On the one hand, it's perfectly suite -- a taut story that can easily fit 70 minutes without losing a thing. It's also likely to be one of the most graphically intense stories the Warner Animation team has done with the DC characters, so for those unfamiliar with it -- consider that a trigger warning. The classic one-shot features a possible origin for The Joker as well as a horrible rampage that includes shooting Barbara Gordon, Commissioner Gordon's daughter. Though Moore claimed it was not meant to be in continuity, its ramifications did play out in the comics with Barbara becoming the parapalegic hero Oracle. Almost as soon as it was announced, fans started buzzing about Mark Hamill's involvement. The actor "retired" from the role of The Joker after the videogame Arkham City, though even then he had said that he wanted to do it one last time IF The Killing Joke were ever to be adapted into another medium. On Kevin Smith's "Fatman on Batman" podcast, Hamill had even suggested doing it as a sort of an audio book. But there had been no bites. Fans took to Twitter and asked Hamill, who responded with "you're not the only ones with fingers crossed." And today, Collider makes the claim that they've confirmed not only will Hamill voice The Joker, but that he's actually already recorded the part. But we have to say "makes the claim," because despite a pretty good track record for the site, this has not officially been publicly announced or confirmed by Warner Animation. Yet this DOES seem like a no-brainer, as does the possibility that Kevin Conroy, long-time voice of the animated Batman, would return to the role opposite Hamill. Conroy tweeted out his hope as well, and we may be all getting happily played in a magnificent publicity stunt. 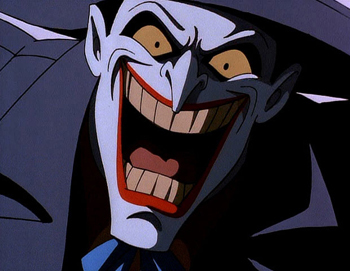 Mysteriously, everyone seems to be forgetting that Hamill already HAS voiced at least a part of The Killing Joke. The pilot episode of the WB's Birds of Prey recreated part of it as the origin for Oracle. Though a tall, thin actor physically portrayed The Joker, what few lines of dialogue he had were dubbed in by Hamill as a nod to his then ownership of the role. Regardless, our fingers are crossed, too, hoping that all the rumors and possibilities pan out. It would be a great farewell to the roles for both actors in the medium that started it for them. And for Warner Animation it would be a boon because let's face it -- after Star Wars: The Force Awakens opens, even my mother will be wondering what Mark Hamill is up to.